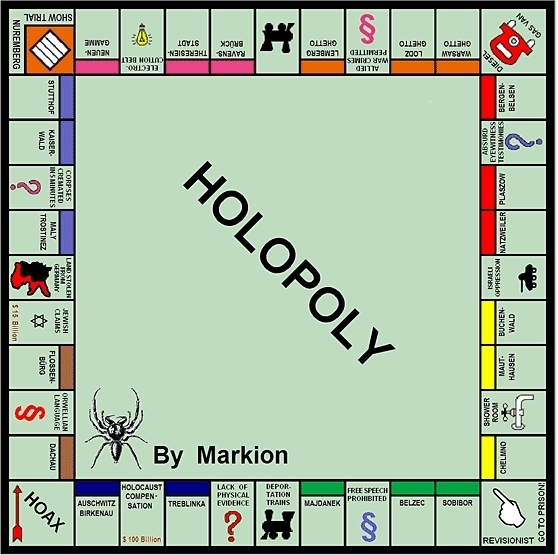 Holopoly. Image found at a Stormfront Forum discussing the Holocaust denying Bishop. Stormfront's Motto is 'White Pride World Wide'. That should tell Du enough about them.. Wallpaper and background images in the Debatte club tagged: holocaust denial stormfront holopoly jews debate religion. Yeah I know. I was really disgusted with the stormfront forums. But because of all the commotion about the Holocaust denying bisshop I was interested to see what the people there had to say about it. And I think it is interesting in debate to add things from the unpopular side. So therefor I added some pictures that are pro-holocaust denying and antisemitic. I hope you aren't offended by this: I understand it is a touchy subject. OMG they put "shower room" on there WTF? I literally do not understand how can people can deny that the Holocaust happened. It's just....I dunno---ironically--- unbelieveable that some people think that way. This is especially offensive to me, as I have been to Dachau. I have SEEN all of this with my own eyes. People that deny it happened obviously haven't ever been there, or met families of people who lost someone there...or everyone they knew for that matter, they being the sole survivor of an entire family, say...Anne Frank's father?